Photo by Brandon Macz: The MLK F.A.M.E. Community Center is closed indefinitely following a sewer line break and flooding inside the facility. Final Update: The MLK F.A.M.E. 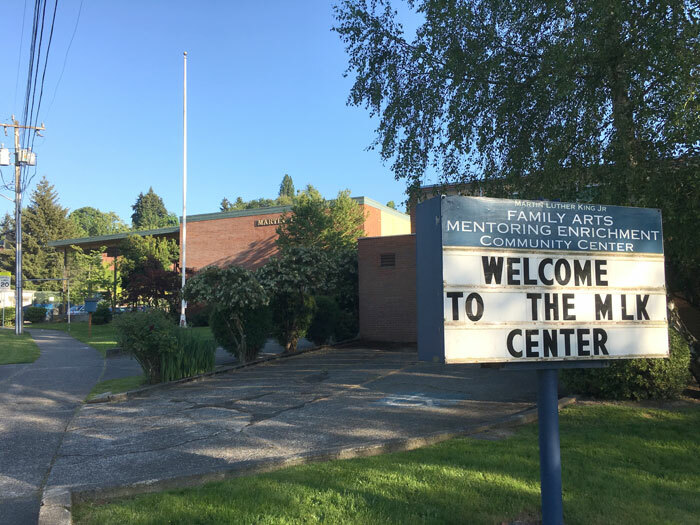 Community Center in Madison Valley reopened on Nov. 15, and the auditorium is expected to be available again to rent by the end of December, after a broken sewer pipe and water line closed the facility in late October. All tenants were back in the community center by Nov. 15. The MLK F.A.M.E. Community Center now expects to reopen by Thursday, Nov. 15, with cleanup of the auditorium and kitchen taking longer than expected following sewer line and water line breaks in late October. MLK Community Center Board secretary Faye Williams tells MPT that contractor SERVPRO needs more time to remove carpet and tiles from the affected areas, and expects to test the air quality in the facility by Tuesday, Nov. 13. “We just want everything to be as environmentally clean as possible before we subject our tenants and guests to enter the building,” Williams said. Raymark Plumbing has already completed the pipe repairs, and Seattle Public Utilities approved. The MLK F.A.M.E. Community Center in Madison Valley expects to reopen as early as next Monday, shutting down in late October to address a broken sewer pipe and water line. Seattle JazzED executive director Laurie de Koch said she received the initial notice about the pipe break on Oct. 26. MLK Community Center Board secretary Faye Williams tells MPT that a sewer pipe on East Republican Street connected to the center broke, and a water line leak extended into the parking area. The Seattle Department of Construction and Inspections issued the community center a permit for an emergency side sewer repair on Oct. 31, which included excavation and curb and sidewalk restoration. The project was valued at $45,000. Williams tells MPT the sewer and water lines have been repaired, but the broken sewer line caused water damage in the auditorium and kitchen. The center is in the process of being cleaned, and Williams says the decision to close the building was de to the odor and air quality. The community center building was constructed at 3201 E. Republican St. in 1959. The Seattle School District transferred ownership of the facility — formerly the Martin Luther King Elementary School —to the First African Methodist Episcopal Church in February 2011 through a restricted covenant agreement, which stipulates that the building be dedicated to community uses. DassDance founder Daniel Wilkins said he’s hopeful he’ll have his dance studio space at the community center back soon. Wilkins said the building is old, but it is also a great community resource. DassDance did get a lucky break on finding temporary spaces for its dance classes. DassDance is also now using some space being provided by Epiphany School in Madrona. Sometimes hip-hop from one class will come through the walls into his ballet class, but he said he’s grateful for the space. Other tenants and users of the community center include Seattle’s Progressive Preschool, Goldinex Basketball Factory, Pinnacle Explorations Outdoor School For Kids, the Seattle United youth soccer club and Rhodesworks Design Studio. Williams tells MPT the center is expected to reopen as early as Monday, Nov. 12. The Madison Valley Community Council also hosts its meetings at the MLK F.A.M.E. Community Center, and had planned to have a meeting there on Tuesday, Oct. 13. MVCC president Penelope Karovsky tells MPT she is looking for an alternate location for the meeting in case the center is still not open by then. Tenants are still unsure when they may be able to return to the MLK F.A.M.E. Community Center in Madison Valley after an onsite sewer pipe broke in late October and flooded part of the facility. Multiple emails to representatives with the Martin Luther King Jr. Family Arts Mentoring Enrichment (F.A.M.E.) Community Center from MPT seeking more information have gone unanswered. The Seattle Department of Construction and Inspections issued the community center a permit for an emergency side sewer repair on Oct. 31, which will include excavation and curb and sidewalk restoration. The project was valued at $45,000. Community center secretary Peggy Foxx emailed tenants on Nov. 1 to inform them no one could be in the building, and that it would be closed until further notice. De Koch said she received the initial notice about the pipe break on Oct. 26. “I know that the auditorium flooded,” she said, but the community center is closed indefinitely. The community center building was constructed at 3201 E. Republican St. in 1959. The Seattle School District transferred ownership of the facility — formerly the Martin Luther King Elementary School —to the First African Methodist Episcopal Church in February 2011 through a restricted covenant agreement, which stipulates that the building be dedicated to community uses. A receptionist at the church directed MPT back to the closed community center. The Madison Valley Community Council also hosts its meetings at the MLK F.A.M.E. Community Center, and had planned to have a meeting there on Tuesday, Oct. 13. MVCC president Penelope Karovsky tells MPT it’s unclear whether the center will be open by then, and that she is looking for an alternate location for the meeting.